The Fire Prevention Week™ Community Outreach for Adults Package has everything you need to raise awareness about fire safety. 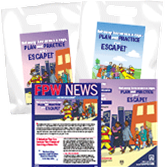 Add a fun and educational component to your Fire Prevention Week (FPW™) events and engage your community with this bundle of essential NFPA® products. The 2018 Community Outreach for Adults Package includes promotional giveaways full of information and strategies that empower adults to make a difference in fire and life safety. These all-in-one kits are ideal for firehouse tours, community and senior center open houses, and other events during Fire Prevention Week 2018 and beyond. Community Outreach for Adults Package materials promote this year’s FPW campaign theme, "Look. Listen. Learn. Be aware. Fire can happen anywhere.™". The Community Outreach for Adults Package provides powerful tools for making a positive impact on public safety. Place your order today!